point. 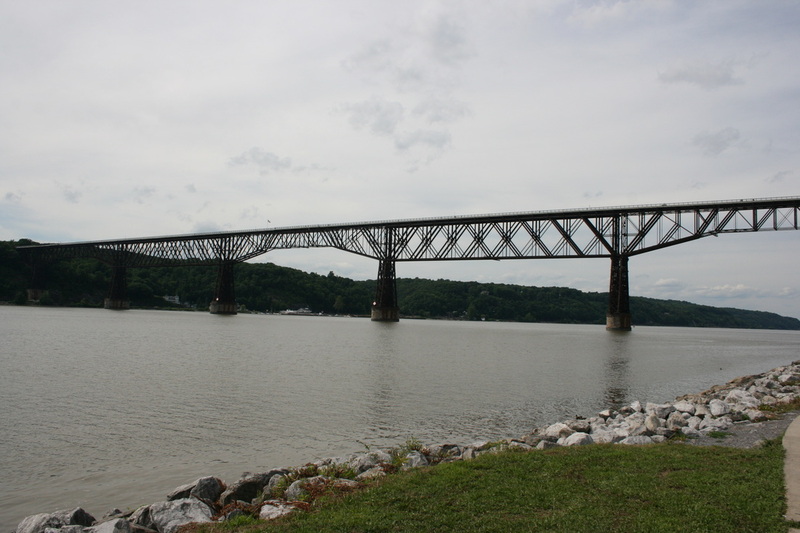 Being too costly to scrap / remove the bridge, it sat vacant until 1998 when Walkway Over the Hudson group assumed ownership of it. 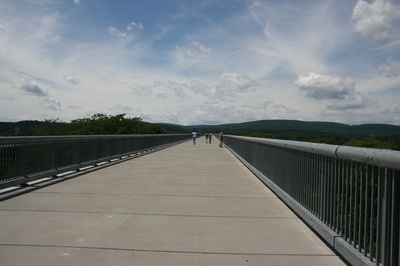 11-Years later, on Oct 3, 2009 the Walkway Over the Hudson opened as the world's longest pedestrian footbridge. The Walkway’s deck is 1.28-miles long and soars 212 feet above the Hudson River. Why do we list this park on this web site? Because it’s a great bridge to watch trains from! 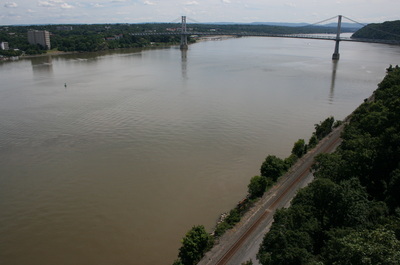 CSX's River Line runs along the west side of the Hudson River with a good 30+ trains a day. Locomotives from all over North America can be seen on a daily bases powering trains on this line. Rail traffic on this line includes just about everything CSX handles; double stacks, intermodal, auto-rack trains, grain trains, oil / ethanol trains and merchandise trains are just some of the trains that you will see during a few hours at the park. 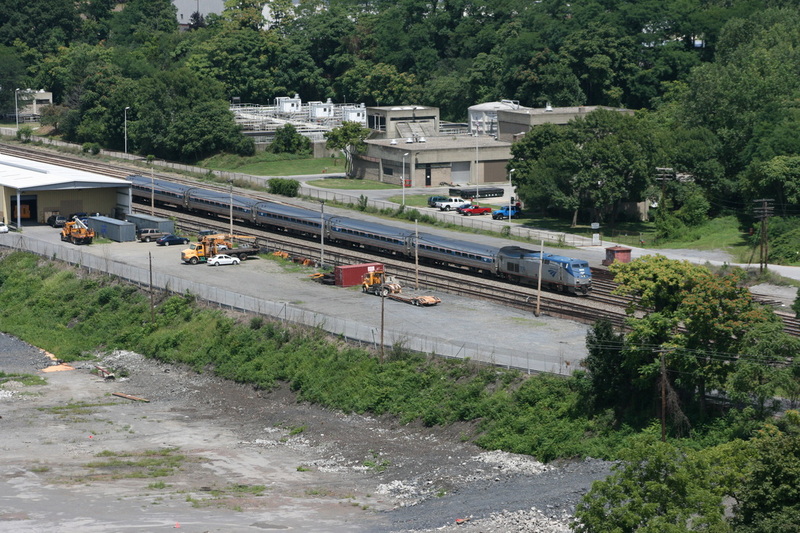 On the east side of the Hudson River is Amtrak's Hudson Line which hosts many Amtrak diesel powered trains as well as Metro-North commuter trains, and if your real lucky, you may catch a CSX freight on the east side as well. Photography from the bridge can be both challenging and rewarding, depending where you are located for a passing train. 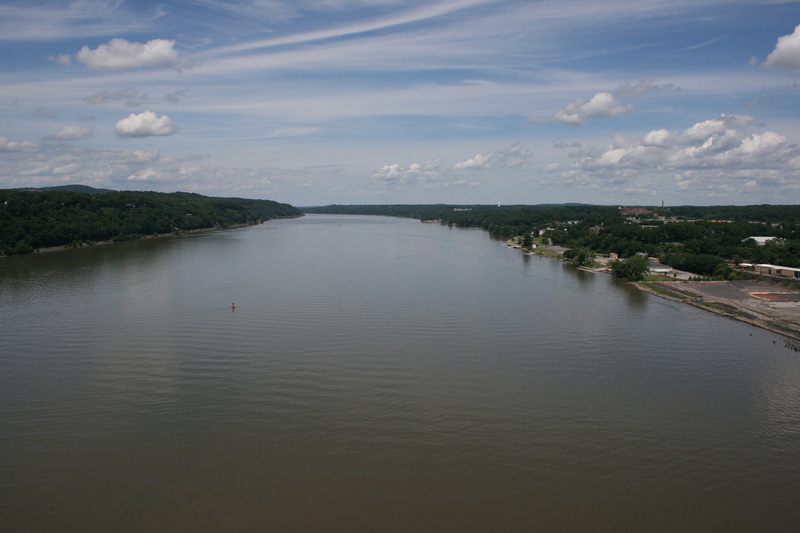 There is over 3000 feet between the River Line and the Hudson Line that is well over half a mile! Moving from one side to another to catch a train almost impossible unless you know it’s coming well in advance. Many trains are best captured with a zoom lens. During my visit, I always seemed to be on the wrong side of the bridge, then again if I had a radio scanner it may of helped me quite a bit. My visit to the park. 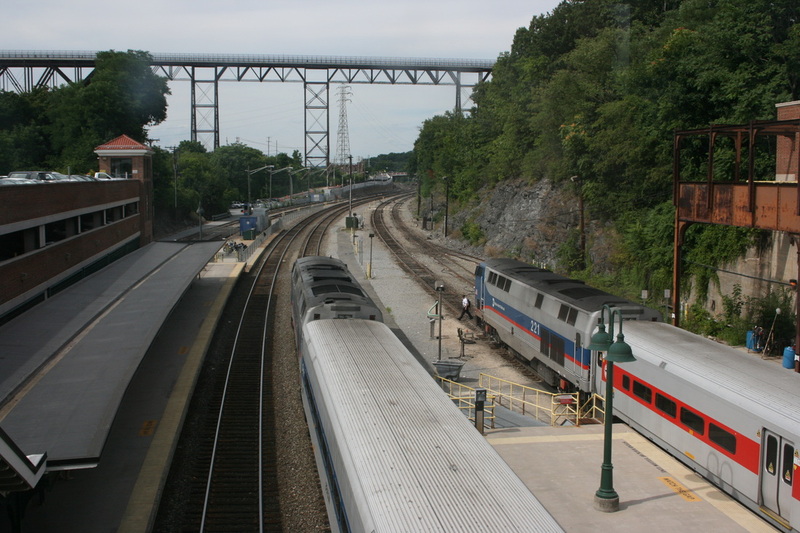 I took an Amtrak train from New York City and got off at the Poughkeepsie train station. It was a good 15-minute walk between the station and the closest entrance to the park which was Washington Street. Across from the Washington Street entrance there is a gas station with a convenience store which is a good spot at get a cold beverage. A quick walk up the stairs and I was on the bridge. On each side of the bridge there are hand written signs posted to alert you to anything special you need to know. 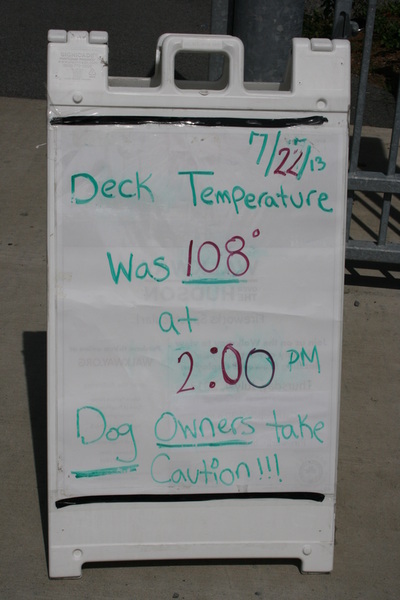 The sign this day read: Deck Temperature was 108 degrees at 2pm, Dog owners take caution and Thunder storms are forecast for this afternoon, the walkway closes during storms and will not reopen until 30-minutes after the storm passes. My afternoon was spent with one round trip across the bridge to the west side and return. 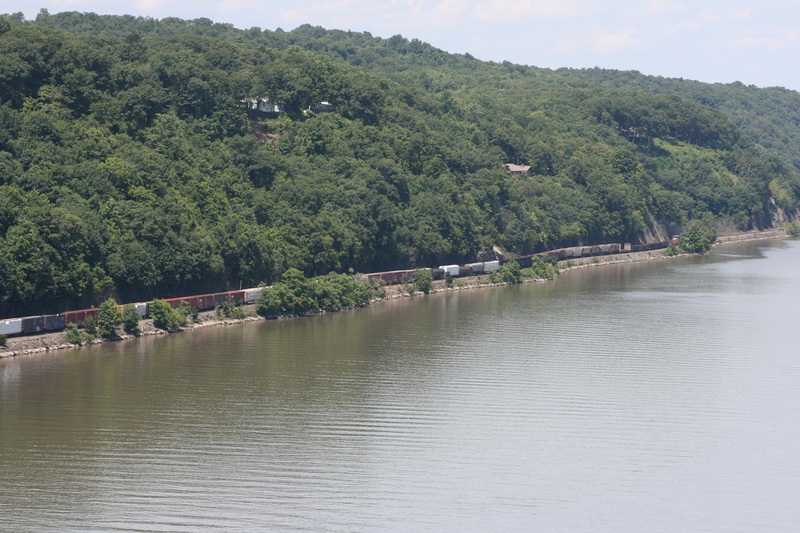 I spent time above the Amtrak Hudson Line until I was able to photograph a passing train. 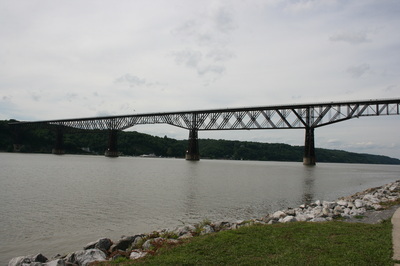 Then I continued west across the span. I was able to capture some nice pictures from the bridge. The river is beautiful and passing boats can be seen while waiting for trains. 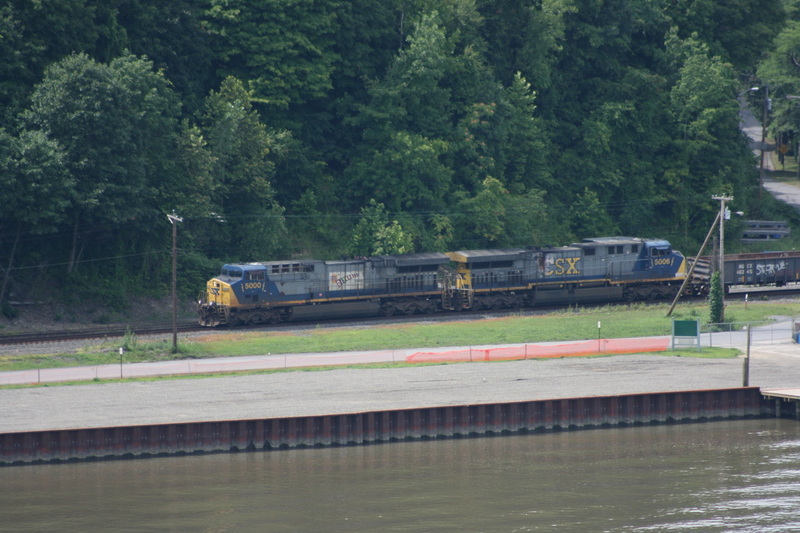 I saw about 4 or 5 CSX freights on the River Line during my visit, I never seemed to be where I wanted to be to photograph them. They had some interesting locomotives on some of the trains. As I reached the west side there is vendors that sell food & beverages, restrooms and picnic tables. There is also a former Pennsylvania Rail Road caboose on display, although it really needed some tender loving care and a lot of paint. It was a nice touch to the park. 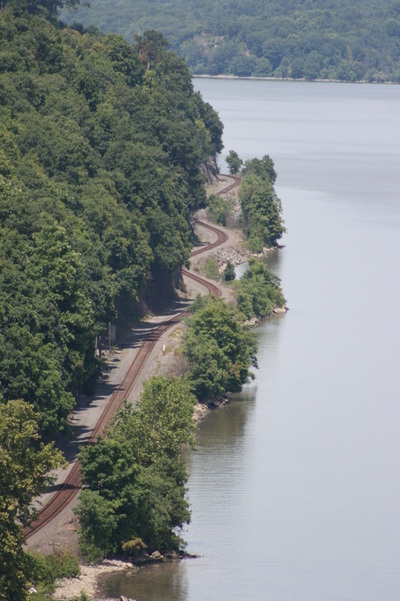 The old railroad line is a 27-mile walking / bicycling trail, made me want to keep walking! There were a lot of people during my July weekday afternoon visit. The vendors were busy selling lunch & ice cream and of course cold drinks. 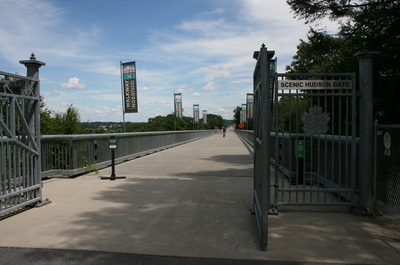 The bridge was busy with people walking, jogging, bicycling and some even walking their dogs. Some people were just spectators like me walking around with cameras; others just seemed to find a place to hang out. I didn't notice any other railfans present, but several people did observe and talk about the passing trains. 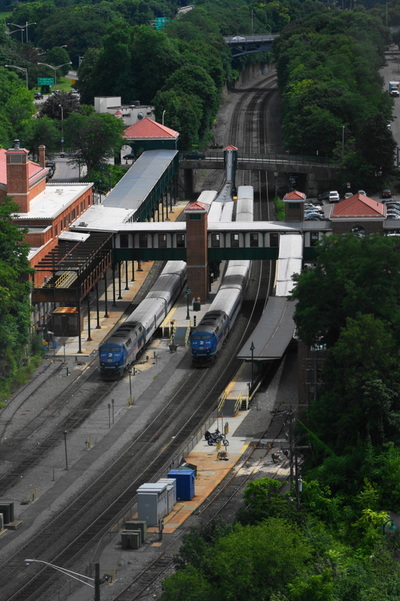 After taking several more pictures as I walked back to the east side, I made my way back to Poughkeepsie train station and took the less expensive Metro-North commuter train back to New York's Grand Central Terminal. I enjoyed my visit, and plan to return again. Once they build the 21 story elevator by the water front, it will be very easy to step off a train and get onto the bridge! Railroad(s): CSX Transportation (Both sides of the river) / Amtrak (east side of the river, passenger trains) / Metro North (east side only, trains do not pass under the bridge - they only come as far north as Poughkeepsie train station which is to the south side of the bridge, but easily viewable from the deck). Rail Traffic: CSX will run over 30 trains daily on the River Line (west side of river), this line is getting busier and CSX is double tracking much of the line. On the east side of the river; Amtrak runs about 26 daily trains through Poughkeepsie. A copy of Amtrak's Empire Service timetable may be a handy reference while you are on the bridge. Metro-North Railroad has several moves in town hourly. 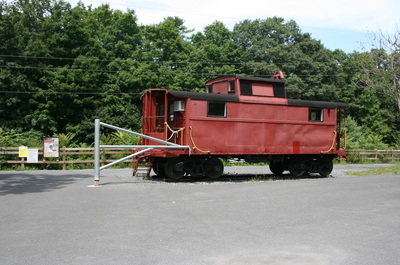 Their diesel powered commuter trains operate in a push-pull mode. Their locomotives are usually on the north end of the train which makes for a good looking photo of their trains from the bridge. 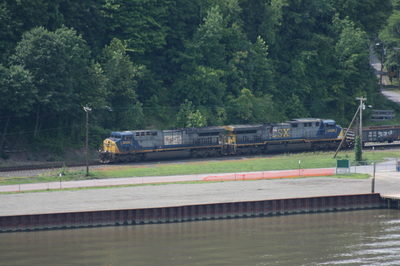 CSX only operates about 6 trains daily on the east side of the river. Four of those trains normally operate overnight (Q-430 / Q-431 merchandise train between Selkirk & Oak Point), and (Q-701 & Q-702, trash trains to-from Oak Point). Local trains maybe seen during daylight.. if you're lucky. some clear areas to photograph passenger trains. The Highland side of the river is very quiet and scenic. 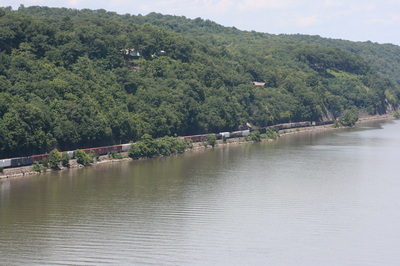 The CSX tracks are right along the water. Walkway State Park is open year-round, weather conditions permitting (closed in the event of lightning or ice). Restrooms on site: Yes, located on each end of the bridge. 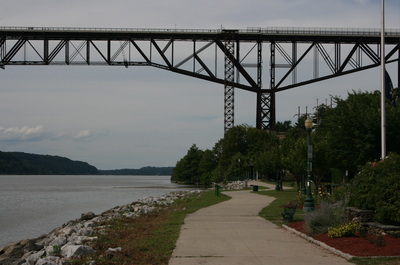 Food: Vendors are located on each end of the bridge. They sell food, ice cream and beverages. 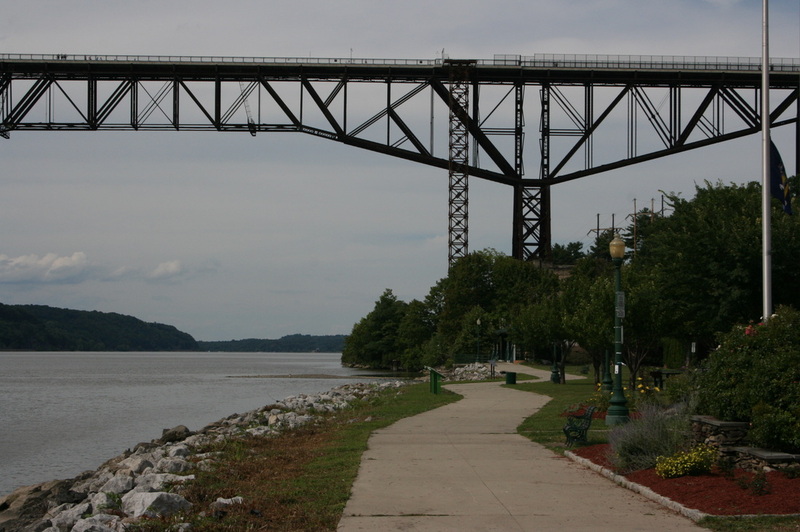 At the Washington Street staircase in Poughkeepsie, there is a convenience store which is a good spot to get a cold beverage or food. Picnic Area: Yes at each end of the bridge. Parking Locations: Parking and entranceways can be found in several locations. 1) At 87 Haviland Road, Highland, NY (Ulster County), parking is allowed along the north side of the road, with ADA-compliant handicapped parking spaces at the entrance to the bridge. 2) At 61 Parker Avenue, Poughkeepsie (Dutchess County) there is an 80 car NYS parking lot, with ADA-compliant handicapped parking provided. There is a $5 fee to park in this lot. 3) At Pulaski Park, Washington Street, Poughkeepsie (Dutchess County) there is limited free parking. This park is one block north of the bridge. There is a stairway from Washington Street directly to the bridge entrance. 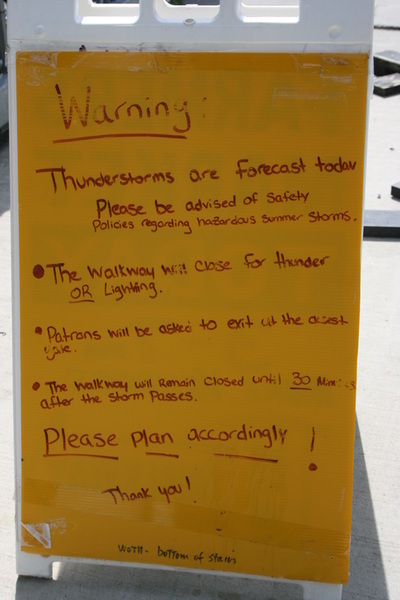 4) Some City of Poughkeepsie streets in the vicinity of the Walkway (please check parking signs carefully). Lighted for eveing railfanning: NO, park closes at Sunset. 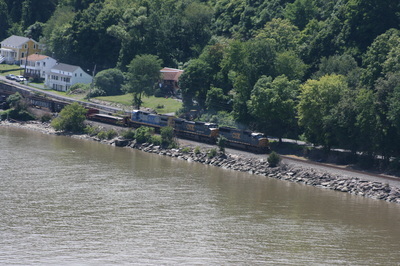 Motels / Hotels: There are no railfan motels in the area, but hotels can be found on both sides of the river. Map: Map marker notes the parking lot on the east side of the bridge.